This app enhances your experience using Autodesk® BIM 360® 3D models and saves them for uploading to your website. 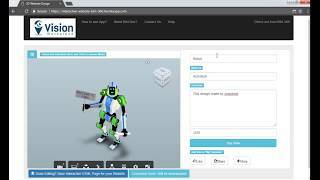 This application is useful when designing your own HTML as it embeds 3D models into it and uploads them to a website. It is especially useful for 3D part online sellers as they can have a 3D model embedded into their website. It supports processing of 3D models. This is the WebGL based 3D content, displayed in the browser along with interaction facility using mouse or touch controls. 1. Add details of 3D model in HTML fields. 2. Save that page after done editing of data fields. 3. Upload saved HTML page to your website. 1. Save your 3D design as static HTML page for website. 2. Can use inbuilt template to fill description and other details of design.